You can think of the RN516 as a more powerful (and expensive) version of the Intel Atom powered RN316. The spec comparison chart below shows the key differences betwen the two are more memory (4 GB ECC vs. 2 GB) and a more powerful CPU (Intel i3-3220 vs. D2700 Atom). 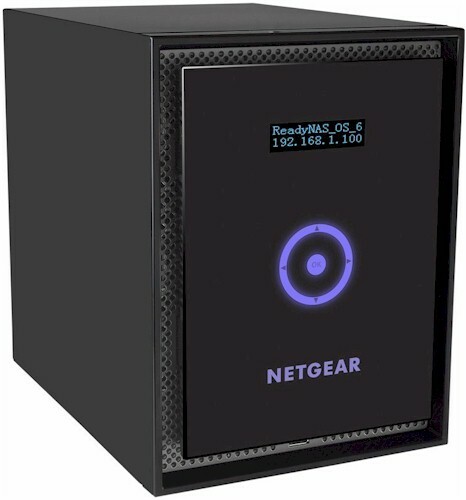 The RN516 is the only new ReadyNAS that is i3 based; there are no two or four-bay versions available. The RN516's front panel has the same display and touchpad on its swing-away cover and power switch behind it as the 316. The lone USB 2.0 port is tucked under the bottom edge of said cover so can be reached without swinging it open. You can't lock the front cover shut and the drive trays have just a little slider to "lock" them into place. Speaking of the drive trays, they are not the tool-less trays found in the RN100 and RN300 models. I guess if you can't use a screwdriver to secure your drives to their trays, you shouldn't be spending over $1000 on a NAS anyway. NETGEAR told me that the RN516 does have the tool-less trays found in the RN100's and RN300's, and, upon recheck, they sure enough do. My confusion stemmed from NETGEAR's belt-and-suspenders approach of screwing the drives into the trays anyway on diskful models. The 516's rear panel is a tad different, sporting and additional eSATA port and what appears to be an expansion card slot blocked by a blank removable panel. Otherwise the port complement of one USB 2.0, two USB 3.0 and dual Gigabit Ethernet ports is the same. The RN516 is designed for easy serviceability. But even to replace the single 120mm case fan, you first need to remove its matte black metal cover. The shot below shows the rear panel removed after unplugging the fan and AC power cables. Removing four more screws lets you swing down the metal plate holding the main board, which is attached by four cables in addition to the two edge connectors that bring SATA lines to the six bay drive backplane. The i3 lies under the big ol' heatsink and its companion device under the smaller heatsink to its left. I didn't go exploring under the smaller narrow heatsink right above the i3. I suspect it cools power circuitry, judging from the components near it. That black connector at the top of the photo appears to be a PCIe x4 slot. But if it is intended to house optional 10 GbE or additional Gigabit Ethernet ports at some point, a right-angle adapter will be needed to properly line the board and slot up. Right now, neither is listed as an available option. NETGEAR also doesn't say whether memory can be expanded by using that empty DIMM slot. The key components are summarized in Table 1 with the RN316's for comparison. NETGEAR supplied an RN51661E diskful model for review with six "enterprise grade" Toshiba MK1002TSKB 1 TB drives. Power consumption measured 53 W with the six drives spun up. I couldn't measure power consumption with the drives spun down because idle drive spindown still isn't supported yet. Fan and drive noise were classified as medium since the NAS was clearly audible in my quiet home office. I noticed that fan speed occasionally increased under load during testing. Fans also come on with a roar during initial boot. See the RN104 review and Craig's in-depth look at OS6. The feature set is the same across all ReadyNASes that support OS6.